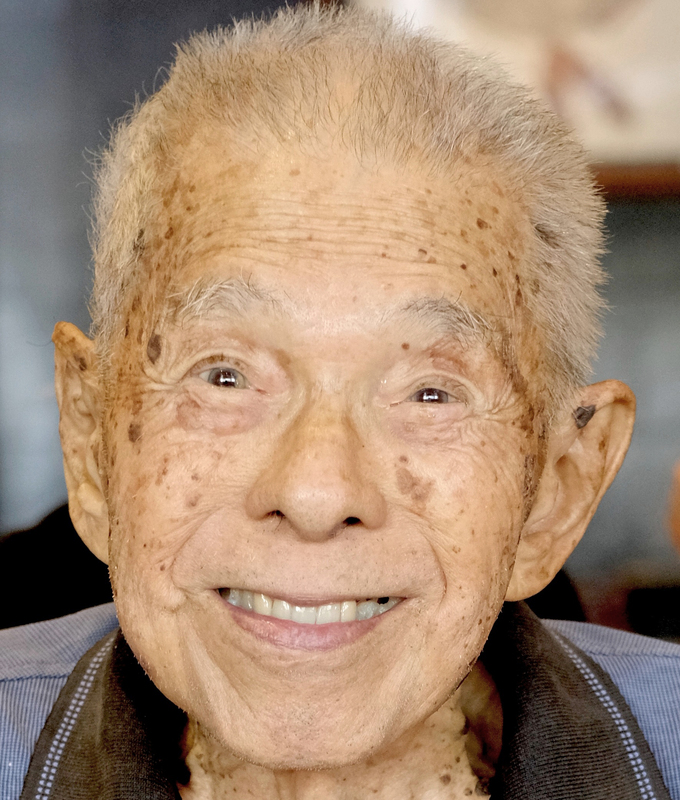 Joseph Koon Chew LEE, life-long resident of Honolulu and widower of Dorothy Lai LEE (1916-2009), passed away at home on January 2, 2018, at the age of 101. Joe had been featured on the occasion of his 100th birthday in Michael Tsai's Honolulu Star-Advertiser Incidental Lives columns of Feb. 23, 2016, and March 1, 2016. Named Koon Chew LEE when born February 29, 1916, he was the second Honolulu-born child of Mr. LEE Bew (1882-1969) and Ms. LEE Chang Shee (ne CHANG Bau Sam, 1886-1961). He was born in his family's Chinatown apartment at 1023 Kekaulike Street, which had apartments above a store and a chicken pen surrounding the building entrance used by residents. When he entered Honolulu's St. Louis College at the beginning of 5th grade, his teacher recorded "Joseph" as his first name; and he later began using that as his legal first name. Joe's parents' 1903 marriage in China beat long odds, overcoming serious obstacles. Preauthorization requirements, transcribed interrogations, and other hurdles imposed by the Chinese Exclusion Act of 1882 could easily have blocked it. In 1896six years before that act's extension in 1902 to HawaiiLEE Bew had emigrated alone at age 14 from Chongtoucun, Shaxizhen (Longdu Subdistrict), Zhongshan District, Guangdong Province. He was soon employed as a butcher in the Honolulu Chinatown shop of his mother's younger brother, CHUN Quon (C.Q.). To rebuild after the Great Honolulu Chinatown Fire of 1900, C.Q. sold stock to form C.Q. Yee Hop & Co.; and LEE Bew was one of its founding stockholders. LEE Bew's status as a stockholder proved critical in 1903 to his gaining U.S. Government preauthorization for a bride-seeking round trip to China. CHANG Bau Sam, a seventeen-year-old woman with bound feet from the one-mile-away village of Qianshancunremembered for her kind and cheerful disposition, delicious cooking, and skillful Tien Gow playwas LEE Bew's pick among 6-7 candidates. Because LEE Bew then planned to accumulate wealth as a sojourner in Honolulu and eventually retire to China, he returned to Honolulu after a 10-month stay, leaving behind his wife and one-month-old son. He returned for a one-month visit in 1908. In 1911, having decided to settle in Honolulu, he returned to China for his family. In July 1912 (following a 12-13 month stay), LEE Bew, LEE Chang Shee, and their recently born, three-month-old son embarked on a permanent move to Honolulu. Their first childnine years old and attending schoolremained in China. Their infant son died during the voyage and was buried at sea. Joe, cherished by children and adults alike for his cheerfulness, attentiveness to others, and good-natured playfulness, had a magnetic personality. He could playfully banter on the telephone to the last month of his life. His amiability and insight were matched with a sharp mind, which made him a natural leader. Retiring in 1974 as Hawaii Telephone Company's personnel services manager, he had risen to the highest position available in that corporation to a person whose access to postsecondary education had been blocked by the Great Depression. He also served as president of the Hawaiian Tel Federal Credit Union and the Hawaii Central Credit Union. He analyzed most of what he didhis work, retirement planning, playing bridge, playing mah jong, various card games, and playing sportsand he drew on his resulting understanding of those activities when teaching and advising others. Joe was a talented, versatile, and energetic athlete. His tennis accomplishments included Honolulu's 1930 boys-15-and-under tennis singles title at age 14, the 1931 Hawaiian Open Junior Tennis Doubles Championship at age 15, the 1932 Honolulu tennis doubles championship at age 16, and tournament play through the 1950s. In baseball, his brother Ed and he were recruited during their teens by a league-dominating Japanese team in the Young Buddhist Association, who declared them "honorary Japanese." He was also a baseball standout at Mun Lun [Chinese] School, on the O.P. Blues's 1941 championship team in the Lanakila Baseball League, and the softball team of Aloha Motors during his 1938-1941 employment there as the accounts-receivable bookkeeper. In bowling, local sports-page reports described him as leading his company's teams to championships. His bosses at Hawaiian Telephone would often declare a pause to his office work so that he could accompany them to the bowling alley. They also sought him out as a golfing partner. His most memorable golf accomplishment was a 150-yard hole-in-one on Pali Golf Course's hole 7 when he was 69, but he continued to walk that 18-hole course three times a week into his mid-80s. Well into his 80s, he could humble most opponents in ping-pong. He attributed his long, never-hospitalized life to his physically active lifestyle. A strong advocate of education, Joe valued the benefits that he had gained from his solid 5th-through-12th-grade education at St. Louis College; and he regretted the opportunities that he had lost by not going further. Mindful of his personal experience, he was determined to give his children every possible educational opportunity. His wife Dorothy and he made remarkable personal sacrifices so that their son and daughter could attend Punahou School and mainland colleges. Joe's generous commitment to education lives on in his children and grandchildren. Joe was preceded in death by his wife Dorothy, son Leighton Mun Chew Lee (1943-2005), and U.S.-born siblings Edwin Chock Hing Lee (1913-1973), Gladys Lee Wong (1918-2015), Mildred Lee Kim (1920-2015), George Washington Lee (1924-1924), Richard Hu Kong Lee (1925-2011), and Florence Lee Chang (1927-2016). He is survived by his sister Nancy Lee Nakagawa of Honolulu; daughter Lanette Lee Price of Madison, WI; five grandchildrenJoseph Thomas Fu-wei Lee of Honolulu, Meridith Hsiu-hui Lee Hess of Los Alamitos, CA, Nathan Fu-jung Lee of Honolulu, Joel Frederic Wei-ming Price of Philadelphia, PA, and Alana Yu-lan Price of Ann Arbor, MI; and ten great-grandchildrenTa Maile Mei Lan Ing-Lee, Thomas Leighton Hess, Alyssa Makiko Noelani Lee, Taryn Leilani Hess, Bree Kiliohu Lian Ing-Lee, Elijah Mun-chew Lee, Tegyn Malia Hess, Elle Kau'ikeolani Meilin Lee, Isaac Kalunakahele Jun Wah Lee, and Wren Feiming Armstrong-Price. Graveside services were held February 10, 2018, at Hawaiian Memorial Park Cemetery, 45-425 Kam Highway, Kaneohe (Pali View Garden, Lot 25, Section B; N 21.39056, W 157.79472).